The Severalnines team is pleased to announce the release of ClusterControl 1.2.9. This release contains key new features along with performance improvements and bug fixes. We have outlined some of the key new features below. Join us for our Release Webinar on March 24th, which includes a live demo of the new ClusterControl 1.2.9. Support for PostgreSQL Servers: We are excited to announce support for PostgreSQL, probably the world’s most advanced open source RDBMS. Companies using Postgres can today install ClusterControl to have it monitor database metrics, queries and schedule backups. For more details, please see this blog post. With this new addition, ClusterControl now supports MySQL with its main variations MariaDB, Percona XtraDB and Galera Cluster, PostgreSQL and MongoDB. 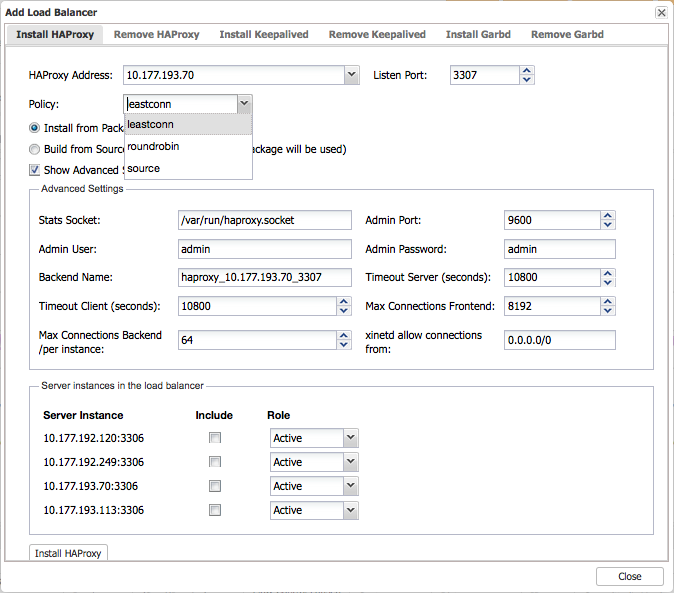 Advanced HAProxy configuration and built-in stats: When deploying HAProxy load balancers in front of your database nodes, it is now possible to configure advanced settings such as connection timeouts, max number of frontend/backend connections, which backend servers (DB nodes) to include and whether they are deployed as an active or backup instance. It is no longer needed to launch a separate window into HAProxy’s webadmin application to monitor the HAProxy performance.stats are now displayed directly within ClusterControl. Database nodes can now also be disabled from the load balancing set directly from ClusterControl, e.g. if you would like to take a database node offline for maintenance. Hybrid Replication for Galera Clusters: Combining Galera and asynchronous MySQL replication in the same setup, aka Hybrid Replication, has some useful use cases. An asynchronous slave to a Galera cluster can serve as a remote live backup, or as a loosely coupled reporting server that does not impact Galera performance. In one click, it is now possible to setup a replication slave to a Galera Cluster. The slave is bootstrapped with an XtraBackup stream from a chosen Galera master node. In case of master failure, replication can be failed over to another Galera node. Note that this is available with MySQL 5.6, and makes use of GTIDs. We covered this topic in a previous blog. Galera Replication Traffic Encryption: Deploying Galera clusters across WAN environments might lead to concerns around data privacy and security. Encrypted replication hides what is sent between the Galera nodes, and makes sure each node is only communicating to the ones it trusts. SSL replication can now be easily enabled using one single command. For more information about how this works, as well as performance impact, please see this previous blog. The communication from ClusterControl to the managed MySQL/MariaDB nodes can also be encrypted. A locked padlock icon next to the node IP addresses indicates secure encrypted Galera Replication. Query Deadlock Detection in MySQL-based systems: This allows you to spot long running queries, and detect which queries are causing deadlocks and which transactions are waiting. An alarm is sent with information about the deadlocked queries. db_long_query_time_alarm=X [seconds] in cmon.cnf controls the timeout. Bootstrap Galera Cluster: Galera requires you to start a node in a cluster as a reference point, before the remaining nodes are able to join and form the cluster. This process is known as cluster bootstrap. In the event of a cluster-wide crash, you would need to decide which cluster node contains the database you want to go forward with. All other nodes will see that initial node as a reference point to sync up data. In some cases, ClusterControl will not attempt auto-recovery of your crashed cluster - e.g. if it is not able to determine which node has the most advanced data. The administrator is asked to make the decision, and ClusterControl will automate the process of bootstrapping the cluster from the chosen node. Restore of Backups: The backup functionality has been rewritten. The UI provides visibility of all backups and backup sets consisting of a full backup and incremental backups. 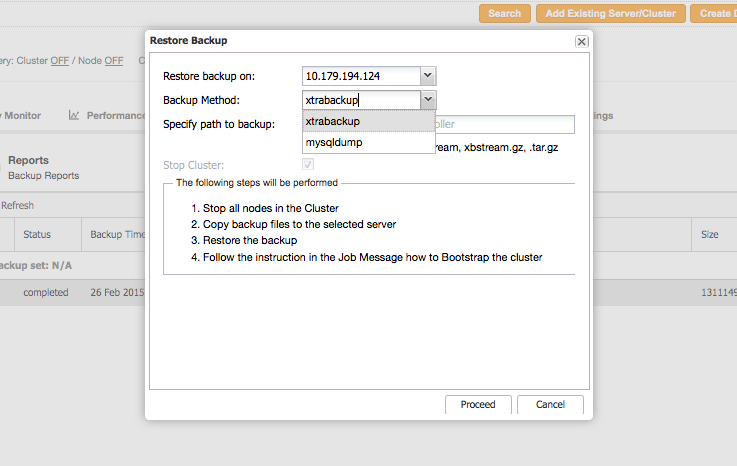 Administrators can, with a single click, restore backups on their clusters. Backups can be ClusterControl originated, or created using other external tools. New UI theme: You will notice that 1.2.9 has a modern UI; more intuitive, better organized, and a pleasure to look at visually. Cluster specific actions have been re-organized into a list that is easy to access. Alarms from all clusters are now displayed in a global list, there is no need to drill into each cluster to see the alarms anymore. RPC Interface to ClusterControl: ClusterControl now supports several new RPC interfaces, directly on the controller daemon, for jobs and statistics handling. The front-end UI has started to migrate over to use CMON RPC calls instead of the CMON API. CMON RPC improves performance and scalability by reducing dependency on the CMON DB, it returns live data directly from the daemons memory. Chef Recipe and Puppet Manifest for ClusterControl: If you are automating your infrastructure deployments with Chef or Puppet, then you would be interested in our Chef Recipe or our Puppet Module for ClusterControl. The goal here is not to replace existing automation tools, but rather supplement them. For a great example on how ClusterControl supports a Puppet-controlled environment, see this webinar replay. Zabbix Plugin for ClusterControl: Following plugins for Nagios and PagerDuty, we added support for another popular open source monitoring platform - Zabbix. Zabbix users can now get information about the status of their database clusters, backups and alarms. More information about how to install it can be found in this blog. Note that enterprises can leverage the CMON API to integrate ClusterControl into any other existing monitoring or management tooling. We encourage you to provide feedback and testing. If you’d like a demo, feel free to request one. With over 7,000 users to date, ClusterControl is the leading, platform independent automation and management solution for MySQL, MariaDB and MongoDB clusters. Thank you for your ongoing support, and happy clustering! Jean-Jérôme Schmidt, Vice-President of Marketing, Severalnines, is a builder of communities, be they for developers, prospects, customers or partners. He joined Severalnines to do just that: build and support the growing Severalnines Community. Prior to joining Severalnines, Jean-Jérôme was Director of Marketing at SkySQL, MariaDB, where he oversaw all marketing related activities and introduced the MariaDB merger (amongst other things). He had been Director of EMEA Marketing at Pentaho Corporation previously, where he introduced and built an international marketing function for the region and also held senior management positions at Sage Technologies as well as at MySQL / Sun Microsystems in Global Sales Operations. Prior to that, Jean-Jérôme was Commercial Director at a leading direct marketing agency, where he ran its Irish operation. Good system administrators and devops hate performing mundane tasks and constantly look for ways at automating themselves out of the job. There are plenty of automation tools out there to help the cause. But if automation is a no brainer, why aren’t more people doing it? In this blog post we compare three ways of deploying a MySQL Galera cluster - manual, Ansible playbook and ClusterControl. Doing a performance monitoring in TimescaleDB is always a challenging task, especially for a very huge time-series data. ClusterControl offers a way to help a DBA or a developer to make things feasible and productive with the aid of the different features integrated within ClusterControl. Check out this blog as we showcases what are these and how you can leverage ClusterControl to monitor your TimescaleDB cluster. 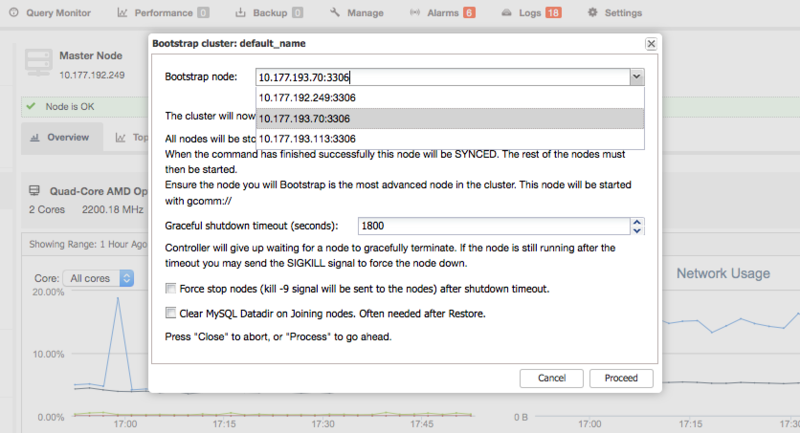 ClusterControl 1.7.2 includes support for TimescaleDB, MySQL 8.0 and Maxscale 2.2 as well as improved support for PostgreSQL monitoring & backups. It also launches two new features, CC Spotlight (a new search tool) and CMON HA (distributed fault-tolerant controllers).